As you can see, the 3CE Glossing Waterful Foundation made my pale skin look more vibrant and glowing. 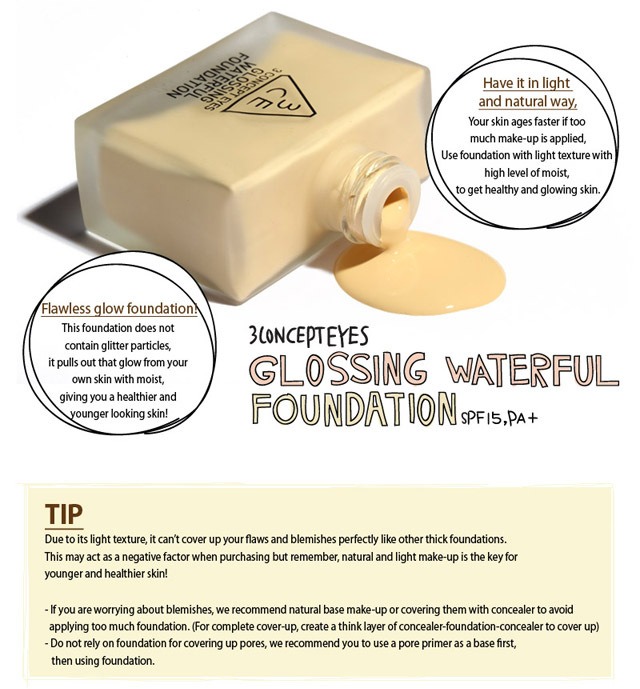 Texture was very light and coverage was not so good but as written here (or see image below), it is purposely made that way because it is more likely intended for everyday use, so our skin can still breathe easily while having that healthy, glowing look. More plus point, it is enriched with SPF 15 to protect your skin from harmful sunlight. Personally, I think it delivers what it promises, but I like my skin a bit matte because it is already very oily by nature, so this wouldn’t be my first choice for skin base. But I think it would be great for those with dry or super dry skin! Click here for complete information about this product. The stylish matte bottle comes with a cap and a pump. Very hygienic and the pump works great (pushes just the right amount as intended). Just a small amount of the 3CE Highlight Beam has made my skin glossier and a better light reflector. Notice that it also gives glittery effect. This one was purposely made for face and body use, so you can also use it on your collarbones, shoulder, shin, etc to highlight those features. ^^v It was easy to blend, soft, very lightweight and non sticky. Click here for complete information about this product. I also patted on loose powder above the foundation to make it less glossy on my already-oily face, but it didn’t stop the glowing effect, especially with the highlight beam on top. I used the Glossing Waterful Foundation on my whole face and the Highlight Beam on my cheekbones and my nose. Your skin is so dewy and flawless! I love 3CE product too! great review, I love the result on your skin! omg, your skin is so flawless! That skins though! So flawless!! Thinking to purchase this because I never buy any foundation before after reading your post which said that this foundation is so light! And my skin is dry type so it's perfect since I love dewy skin looks! Thank you for the review! I need this foundation in my life!